most urgent 9-minute skillset menus ever MOOC. Ultimately, it is about doctors, nurses, other health professionals—and increasingly community health workers who have no professional training—working effectively together for the benefit of patients. This work needs to focus on improving public health, promoting health and reducing chronic, non-communicable diseases related to lifestyle (obesity, cardiovascular disease, diabetes, lung cancer) that are spreading rapidly in developing and developed countries (12, 13). As the editor of Scientific American Lives has pointed out, we were not asked to supply references or data; however, there is ample evidence to support all that we highlight in our article. Some of the evidence is summarised in the articles published in the BMJ and in our other references (1, 2, 9, 16). The Cochrane Library, probably the best repository of evidence on what works in health care, contains many systematic reviews on the effectiveness of nurses in a variety of roles (14); here is the conclusion from just one source:“The findings suggest that appropriately trained nurses can produce as high quality care as primary care doctors and achieve as good health outcomes for patients” (15). The benefit of provocative articles is the debate that ensues as it invites us all to think more critically about complicated issues. We look forward to the ongoing deliberation and the opportunity to witness demonstrated changes in the ways in which health workers can cooperate to improve global health, particularly given the dearth of resources. There is a growing global shortage of nurses (16). Pervasive negative comments on the part of doctors toward nurses do not create an environment that is conducive to recruiting sorely needed men and women into the nursing profession. This shortage exacerbates the problem of promoting health and providing adequate care to our ever growing and aging populations in rural and urban regions. (6, 7) In turn, we continue to fail the people who need us the most. 3 Barrett T, Boeck R, Fusco C, Ghrebrehiwet T, Yan J, Saxena S. Nurses are the key to improving mental health services in low-and middle-income countries. International Nursing Review2009;56:138-141. 4 Ter Bogt NCW, Bmelmans WJE, Beltman FW, Broer J, Miit AJ, Van der Meer K. Preventing Weight Gain: One-year results of a randomized lifestyle intervention. American Journal of Preventive Medicine 2009;37:270-277. 5 Rowen L. The medical team model, the feminization of medicine, and the nurse’s role. Virtual Mentor 2010;12:46-51. 6 Australian Medical Association, 2005. AMA rejects independent nurse practitioners as medical workforce solution. Retrieved 3/15/2010 from http://222.ama.com.au/node/2098. 7 Kuehn BM. Doctoral-level programs prepare nurses for expanded roles in care and research.JAMA 2009;302:2075-2078. 9 Pruitt SD, Epping-Jordan JE. Preparing the 21st century global healthcare workforce. BMJ2005;330:637-639. 10 Villenueve MJ. Yes we can! Eliminating health disparities as part of the core business of nursing on a global level. Policy Politics Nurs Prac 2008;9:334-341. 11 Warnecke RB, Oh A, Breen N. et al. Approaching health disparities from a population perspective: The National Institutes of Health Centers for Population Health and Health Disparities. Am J Public Health 2008;98:1608-1615. 12 Daar AS, Nable EG, Pramming SK, Anderson W, Beaudet A, Liu D, Katoch VM, Borysiewicz LK, Glass RI, Bell J. The global alliance for chronic diseases. [Letters] Science 2009;324:1642. 13 Nabel EG, Stevens S, Smith R. Combating chronic disease in developing countries. Lancet2009;373:2004-2006. 16 Buchan, J. (2002). Global nursing shortages are often a symptom of wider health system or societal ailments. BMJ 2002;324:751-752. Carol Baldwin is Southwest Borderlands Scholar and Director, Center for World Health Promotion and Disease Prevention, Arizona State University College of Nursing and Health Innovation. Dawn Bazarko is Senior Vice President, Center for Nursing Advancement, UnitedHealth Group. Christine Hancock is Director of C3 Collaborating for Health (www.c3health.org) and was President, International Council of Nurses 2001-2005. Richard Smith is Director, UnitedHealth Chronic Disease Initiative. This trip to Cuba turned around on an astonishing moment of serendipity. At a bus stop in Havana my colleague Paul McCarthy heard a laugh he recognized from high school in California. "Only Akua Brown laughs like that," he blurted. And Akua Brown it was, the friend he hadn't seen for a decade, now finishing her fourth year at the Latin American Medical School in Havana. The organization Partners in Health has been transforming health care in the world’s poorest places for 25 years. Nurses like Pat Daoust who were on the front lines of America's AIDS epidemic have put their wisdom to work overseas. We're talking to doctors and nurses who come back from places like Haiti, Ethiopia and rural Mexico with lessons for our own rich country in a medical crisis of its own. Listen Thursday at 9 for healthcare prescriptions from the developing world. The organization Partners in Health has been transforming health care in the world’s poorest places for 25 years. Nurses like Pat Daoust, who were on the front lines of America’s AIDS epidemic, have put their wisdom to work overseas. We’re talking to doctors and nurses who come back from places like Haiti, Ethiopia and rural Mexico with lessons for our own rich country in a medical crisis of its own. Listen Thursday at 9 p.m. for healthcare prescriptions from the developing world. We’re calling all doctors, nurses, and patients this week. Our question for you: what do the best American docs learn treating the poorest of the poor in Malawi, or Mexico, that they couldn’t learn in a robotic surgery lab or a million-dollar MRI suite? Call (617) 353-0692 to record a message that we’ll play at the top of the show. 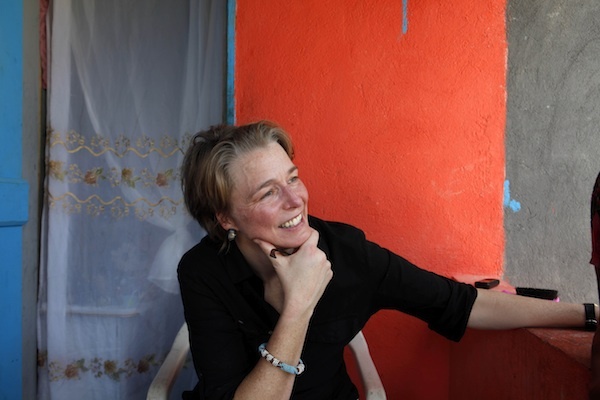 Ophelia Dahl is the executive director and a co-founder (with Paul Farmer, Jim Kim, the late Tom White, and others) of Partners in Health, the Boston-based non-profit that has taken as its mission to bring great health care to the world’s poorest people and “to serve as an antidote to despair”. Dr. Daniel Palazuelos is PIH’s chief strategist at its site in Chiapas, Mexico, and directs their efforts to ensure the success of their community-health workers, who are charged with the “accompaniment” of patients. Pat Daoust is the chief nursing officer at SEED Global Health, an organization dedicated to training a new generation of health professionals for work in the developing world. Daoust has served as one of the leading figures in HIV/AIDS nursing for decades, first with the AIDS Action Committee, then with the Harvard AIDS Initiative in Botswana and Ethiopia. There’s an element of mystery, of openness, of trust, in accompaniment. The companion, the accompagnateur, says: “I’ll go with you and support you on your journey wherever it leads; I’ll share your fate for a while. And by ‘a while,’ I don’t mean a little while.” Accompaniment is about sticking with a task until it’s deemed completed, not by the accompagnateur but by the person being accompanied. “Slow Ideas,” Atul Gawande’s latest essay in The New Yorker, tells us that the important changes in medicine will depend not on easy technological fixes, but on big and sometimes grueling social change. In “From Haiti to Harvard,” on WBUR’s own Commonhealth blog, Rachel Zimmerman tells of the difficulties that community health workers in Boston face every day — and of the promise they represent for the American medical establishment. Our guest, Dr. Daniel Palazuelos, wrote a short piece about the myths and realities surrounding community health workers abroad. And the 2014 annual letter of the Bill and Melinda Gates Foundation looks forward to the hoped-for end of global poverty as we know it. Welcome everyone to the week before the Global Nursing Caucus Annual Conference! The program is packed (see attached) and time will be short, so to maximize discussions GHDonline will host a pre-conference online conversation open to all. And as a reminder to those far from Boston, if interested, you can "attend" the conference virtually from wherever you are. From human rights law, to cardiovascular health, mhealth, accompaniment models and midwifery, we invite everyone to join in on the conversation! "The annual conferences are one of the GNC’s most important initiatives. We believe that bringing nurses together in a focused setting to explore new developments, hear from experts in the field, and share our experiences is one of the most powerful and effective ways to expand the horizons of global health nursing. You can register for either Friday, Saturday or both days. Please contact globalnursingcaucus@gmail.com with any questions about registration. "Our keynote speaker is Nicole Warren PhD, MPH, CNM. Dr. Nicole Warren is an Assistant Professor and a Certified Nurse Midwife at the Johns Hopkins University School of Nursing. She coordinates the Public Health Nursing, Nurse-Midwifery Track at Hopkins which is offered through collaboration with Shenandoah University. Following her Peace Corps Service in Mali, West Africa, she earned her MPH at Johns Hopkins and did her midwifery training and earned her PhD at the University of Illinois at Chicago. Her research focus is on reproductive health in sub-Saharan Africa and among migrant women in the US. Nicole has provided care for refugee and immigrant women in the U.S. and was a founding member of the Midwest Network on Female Genital Cutting. Her most recent research projects addressed work force issues among midwives in rural Mali, family planning demand among couples in the Democratic Republic of Congo, and the role of HIV+ migrant women as reproductive health educators for their families back home. If you would like to attend the conference and are located outside the US, please email globalnursingcaucus@gmail.comfor a registration form. Thank you Maggie for starting this conversation. I am very excited about the upcoming GNC conference as there is going to be multiple opportunities to engage in key conversations on advocacy for everyone who is interested in nursing and public health. We will have presentations and discussions on Ebola and it's impact on health workers; on Challenges & Controversies: Rethinking Roles in Global Nursing, and on creating the future of global nursing. In addition, there will be participants from multiple countries who have direct experience in advocacy, direct care, program planning and evaluation. Friday's program will consist of workshops that will give you the tools for advocacy. There will be multiple opportunities for networking and making connections. I want to encourage everyone who can, to attend either in person or virtually. Thank you, Jeanne, and I look forward to seeing you there. I would like to kick off the week by highlighting a nurse from Mexico. Marina Legorreta will speak about her time living and working as a newly graduated nurse in rural Chiapas, Mexico. Mexico, in addition to other Latin American countries, requires their nurses to complete one year of social service ("pasantia" pronounced pah-sahn-tEEuh) upon graduation and prior to receiving their nursing license. The idea is that rural clinics will have, even if only temporarily, a newly graduated nurse. In reality, and not unlike US professional loan repayment programs, most new grads jockey to remain as close to urban cities/home as possible. The unintended consequence is that many rural clinics remain un/under-staffed. For reasons of race, culture and political history, the states of Chiapas and Oaxaca routinely vie for the ignoble position of "last" in Mexico's statistics for malnutrition, maternal mortality and lack of access to health services. They are the Native American reservations, the Appalacia or the African American communities (take your pick) of Mexico. To be a nurse in these communities is to sign up for hardship. To be a newly-graduated nurse pasante in these communities is more difficult yet. In the Sierra Madre mountain range in rural Chiapas, electricity and running water are not a given; many clinics are not sufficiently stocked with medications or basic supplies; dirt roads, deforestation and rain lead to landslides, making the already difficult-to-access clinics even harder to get to; the clinic may not have physicians, requiring nurses to function beyond their training; regional referral hospitals will be many hours away; and poverty in the communities is ubiquitous. To be an effective nurse in this setting requires fortitude, innovation, resourcefulness and a sense of vocation. It does not take imagination to understand why most nurses (new graduates or otherwise) would shy away from such demands. Marina Legorreta, originally from Guanajuato, graduated from one of Mexico's top universities (Tecnologico de Monterrey) and opted to complete her pasantia in rural Chiapas, in a program supported by Partners In Health's sister organization Companeros en Salud (CES). Marina was CES's first nurse pasante (as opposed to physician pasantes). She will describe her experience and discuss the importance of advocacy, on behalf of patients, rural communities and the profession of nursing. - Is the community/clinic where you work similar to this description? - Do you think your country's nursing schools should require their new graduates to complete a year of social service in an under-resourced setting? - How/should nursing schools address the discrepancies in training/education versus practice setting? I will not be able to attend the conference in person, but am hoping to attend remotely from India, where I will be doing service design research for Merck for Mothers' Project iDeliver. My colleague, Jon Payne, will present our framework for the development of a digital clinical decision support tool and QI program for midwives and skilled birth attendants to make quality improvement in labor wards routine. 1. How might a digital clinical decision support tool be used in busy labor wards in low resource settings? 2. What data would be most useful to midwives/nurses on the front lines? 3. Does anyone currently use clinical decision support aids in a labor setting? I am looking forward to the conference and am very lucky and honored that Barbara Waldorf is letting me speak with Elizabeth Glaser on cross cultural issues in Global Nursing and the risk to nurses working in the field. I have recently returned from Liberia where I was working in a Ebola treatment Center (ETC) for six weeks. It has been quite a ride returning to the USA! I am attaching link to the letter I wrote that was published in the NY Times today on the issue of quarantine for returning Health Care Workers. I am very much looking forward to meeting you all and finding out about all the extraordinary projects that are happening. Debbie, thank you so much for including your powerful post. And I'm eager to hear you present at the conference this weekend. If the NY and NJ decisions were made purely for political grandstanding, I agree that is abhorrent. But how much do you think fear and ignorance had to do with their decisions? I can't imagine putting myself at the risk you and your colleagues did, only to return home to an involuntary confinement. And regarding your upcoming presentation on cross cultural issues in global nursing, and the risk to nurses working in the field, which issues did you find most challenging and/or surprising in Liberia?